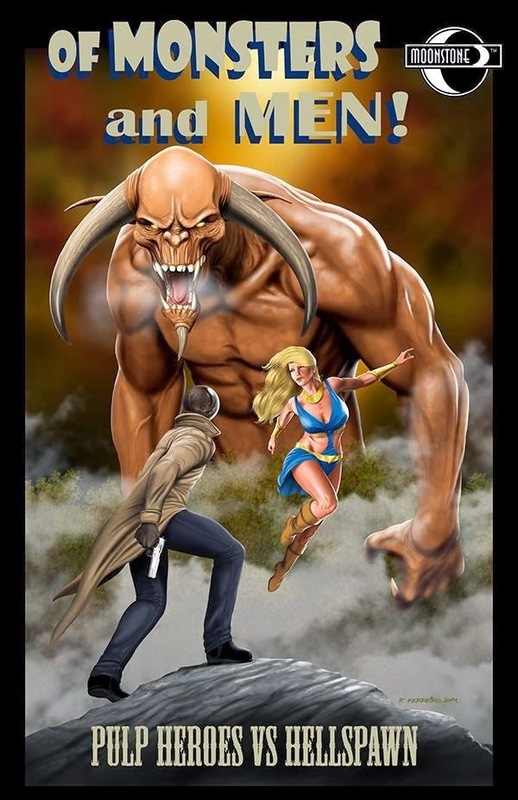 This prose anthology from Moonstone Books features pulp heroes battling monsters. Five stories have crossovers in them. In "Bump in the Night" by Tommy Hancock, Frederick C. Davis' hero the Moon Man battles the Invisible Man, who specifically identifies himself as the same individual of whom H.G. Wells wrote. However, it seems unlikely that John Hawley Griffin would have survived his brutal assault at the hands of Edward Hyde in The League of Extraordinary Gentlemen, Volume II. Most likely, this Invisible Man is an unidentified individual who has replicated Griffin’s formula for his own misdeeds. Adam Lance Garcia's "The Daemon's Kiss" mentions that the Green Lama and Jean Farrell have been a couple ever since their encounter with Cthulhu. The Lama and Jean battled Cthulhu in Garcia's novel The Green Lama Unbound. In Eric Fein's "The Phantom's Ghost," the Green Ghost (George Chance), visiting France, battles a successor to Erik, the Phantom of the Opera, who has apparently stolen the original Erik’s remains. The remains in this story cannot be those of the real Erik from Gaston Leroux’s novel, as he survived at least until the year 2003, when he appeared in Simon R. Green’s Nightside novel Hex and the City. In Sean Taylor's "Golden Amazon Versus Quasimodo, the Hunchback of Notre Dame," John Russell Fearn's character the Golden Amazon, visiting Notre Dame Cathedral, tussles with a cult that has brainwashed Quasimodo into doing its bidding. Apparently Victor Hugo was lying when he referred to Quasimodo’s death in his novel The Hunchback of Notre Dame, and Quasimodo actually acquired extended longevity somehow. Wold Newton scholar Matthew Baugh's story "Sycorax" features Captain Future battling the witch Sycorax (from William Shakespeare's The Tempest) on Titan. There are also references to Segir and Black Pharol from C.L. Moore's Northwest Smith stories, Tsathoggua from Cthulhu Mythos fiction by Clark Ashton Smith, and Jekkara (or Jakkara) from Leigh Brackett's Mars stories. The Captain Future stories take place in an alternate universe where all the planets in the Solar System are inhabited by various sentient species in the 21st century. Do you think that Matthew Baugh's tale could be in the same universe as his crossover with Future, Eric Jon Stark, and Madame Atomos that was in the fourth volume of Tales of the Shadowmen? I thought so. It was one of my favorite stories in Tales of the Shadowmen. On Facebook, Matthew pointed out to me another reference in his story that I missed: the Greymalkin, a large catlike creature found on the moons of Saturn, is meant to be the cat from Saturn referred to in H.P. Lovecraft’s “The Dream-Quest of Unknown Kadath.” So I've added that info to my writeup.